Devin Appelo is never one to shy away from giant drops. This time around, he was given the short end of the stick. Right about now he’s probably wishing he wasn’t wearing vulcanized shoes. Max put down his VX long enough to blast this boneless over Stark bump eariler this summer. Almost every trick in the book has gone down at that spot, but you can never go wrong with a classic boneless.  Nich’s been on quite a tear lately. This photo recently ran in Lowcard along with a few other in his interview. Sometimes photos look better in black & white, but I feel like this one looks a lot better in color. You decide! 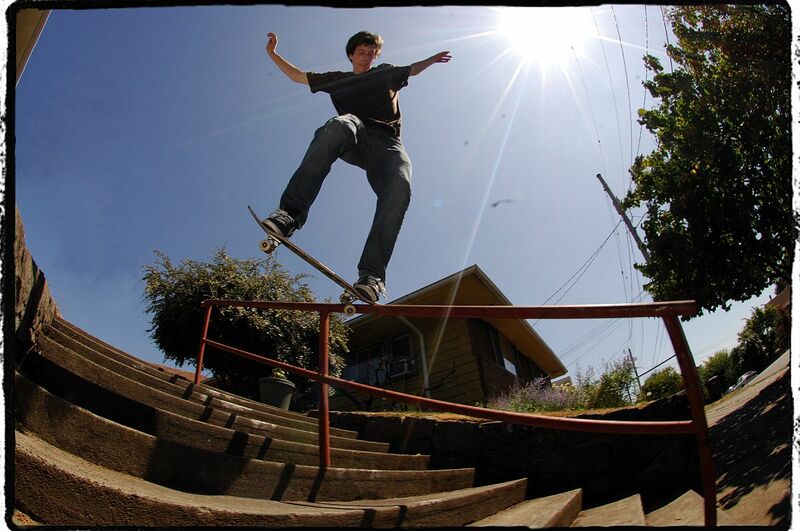 Nick got a photo in Herman Jimenez’ Fresh Crops over at The Skateboard Mag. You got to wonder if PQ knows that spot was in skate videos before he was born. 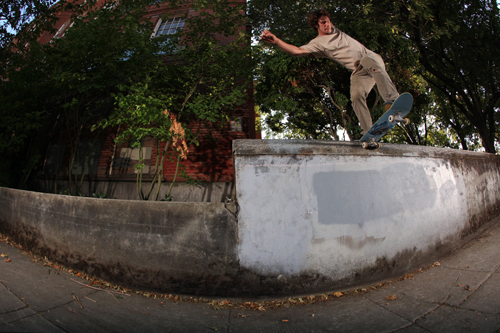 Check out Garric’s Fresh Crops over at The Skateboard Mag. B. Luna in the house!! Check Mikey SB and some of Jon’s other photos here. Been sitting on this McKendry back tail (or as Humphries says “back tull”) at WaMo since last summer. Not bad for Bledsoe’s 3rd favorite Portland skater. Want Bledsoe on your Wallpaper? 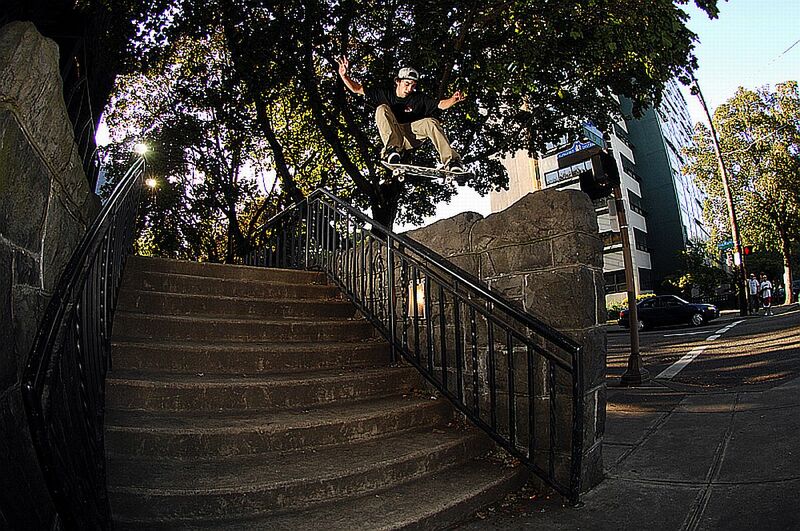 Devin Appelo has a banger of an interview in the new Thrasher. G. Ray shot most of the flicks and the whole interview looks great. Don’t know if anyone if dropping off bigger stuff than Devin right now. PQuist has a part in the new Digital video FYI. You can get it at the Pharmacy right now. You can also see the footage of this over-crook in it. Also, if someone gets a chance maybe they could call Nick and tell him what FYI stands for. One drawback to being 6’3″..
..dwarfing spots. If you’ve seen this rail before you know it’s a tall boy. Ben just looks at it and says, “It’s only just above knee high, I got this.” Ben Luna bump to crookie. Check the footage in “Go Green”. Bracewell has copies available at the Pharmacy for $8 bucks.. you can’t go wrong. Baca hops the wall and takes the elevator down. There’s a pretty good chance that he was at Chipotle 2 hours prior or after this photo was taken. You can make that same prediction whatever the trick is he’s doing. He’s local. TSpence photo. Peter’s been watching Trick Tips..
There’s a whole new generation of Tre Flippers out there and Peter McClelland is a part of that generation. The front foot has taken on an entirely new role and it’s easy to go the wrong direction if you don’t know your role. Does that make sense? 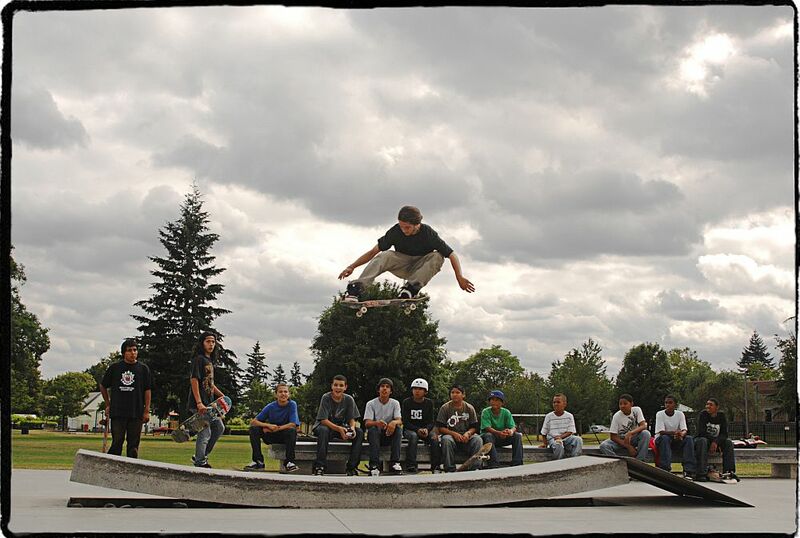 360 Flip at good old Park Blocks. Hey, Ben finally learned blunts..
After years of practice, Ben finally made a blunt. This may be the first of many more to come. Maybe someday someone will bet him $5 that he couldn’t do 100 in a row. B-L-U-N-A with a B-L-U-N-T.
Tommy’s back again with a blazing flick of G Luna with fireball backdrop. This was shot during the Great Heatwave of 2009. The only shade Tommy was getting was when Gabe’s head would cause a solar eclipse during each attempt. …the King of Portland. More details to follow.